Introducing the Mini Marshmallow Dress by Cocowawa Crafts! This sweet little dress is a companion to the Women’s Marshmallow Dress. Ana invited me to be a tester for this pattern, and I’m so glad I said yes. I let my daughter pick out the fabric for her dress, and she chose this cute soft pink snail print, also from Cocowawa Crafts. This is the tester version, so please don’t mind the few fit issues here. They have since been fixed for a perfect fit. I sewed up the size 4, and added 1″ in length to the dress. I omitted the collar and bow options for a simple neckline. I finished the neckline with single fold bias tape. I love the fun details of this little dress such as the ruffle hem and button placket down the back. My daughter usually changes her clothes about 5 times a day. When I gave her this dress to wear one day last week, she wore it for the whole day. This NEVER happens, so I know it was a big hit! I know this dress will be in full rotation all summer long. Ana also sells the Women’s Marshmallow Dress + Mini Marshmallow Dress together in a kit so you can match with your little one! Now to make a matching set! Thanks Ana, we love the Mini Marshmallow! Ana provided me the pattern and fabric for this post. Hey everyone! I recently made this little jacket for my daughter to pair over her Easter dress. I used some left over fabric I had from Fabric Godmother (leftover my saunio jacket), and created a matching one for her. And yes, I’m super lame and did NOT make my kids Easter outfits this year. It’s kind of become a tradition that grandma buys their little Easter outfits each year, and I’m not complaining. My daughters little dress is from Target, now sold out. (But I did make the jacket, so that counts for something, right?). I happened to be visiting my mom at the time, and so she added a little embroidery to the jacket, making it a fun collaboration between the two of us. This project took maybe an hour tops (with cutting out the pattern). I love the look of this little jacket! Now lets cut everything out. The only thing that’s different is you will need to cut the back bodice piece out on the fold, and just one. Sew shoulders right sides together. Sew two sleeves pieces together. Sew into the armsyce (without sewing up the sleeve edges quite yet). Pin the sleeve and side seams edges RST, and sew up the side seam and sleeve all in one go. Okay now pull out your Saunio Cardigan by Named Clothing instructions, and follow along for sewing in the facing and finished the bottom edge. Finish the edges of the facing. Sew the front and back facing together at the shoulder seams. Sew the front facing and jacket front bodice together at the front bottom hem, right sides together at 1/2″. Match the edge of the facing to the front edge of the jacket, RST. Pin. Sew. Trim seams and corners, turn right sides out. Top-stitch along the bodice front and back neckline, tracing the shape of the facing. Add some flair (my mom added a simple blanket stitch with variegated thread– ezm13), and finished! I apologize that I don’t have images to go with each step. I didn’t take any at the time. It’s pretty self explanatory, and the patterns have images to help walk you through each step if you need them! Happy sewing! Happy almost spring everyone! I was recently introduced to Lara Sanner’s coat pattern for children, and I knew I had to make two for my littles. I decided to use a laminated cotton fabric to make the coats water proof (also an option recommended in the pattern). I love the result, and my kids love them too. This coat pattern comes in a great range of sizes: 0-3 years & 3-12 years. I love the front patch pocket detailing (so do my kids, my son is reaching in for his sucker in the above photo). I love the exposed zipper, hood and cuffs rolled to show of the inner lining. This pattern also comes with a collar option too. My kids are 3 and 2, I made a size 3 for both of them, but used the size 4 length for my 3 year old. The sizing is spot on! They are pretty quick to sew up, I made each one in about 4 hours. Maybe a little less than that even. The instructions are very clear and easy to follow. I also wanted to add that I used craft clips to “pin” my pieces together as I sewed. You don’t want to use regular pins because any holes you make will be permanent. BUT I just wanted to add, most “wonder clips” are like 10 clips for $8. I recently got some from Evergreen Art Supply; 100 clips (75 regular size and 25 jumbo size) for $14.95. Such a great deal. So if you’re looking for clips, check out Evergreen Art Supply. I got the zippers from zipperstop! The pink zipper actually matches up better in real life. It looks a little darker in these photos than it really is. For fabric, I actually searched around for quite a while. I had a hard time finding something that I really loved. Then I came across Landofoh and dipped into laminated cotton heaven! You guys! I want all the prints!! Their online shop is out of Korea. I really love the fun, and unique prints they have available in their shop. I also love that their fabrics have a slightly matte finish to them. They are not sticky and shiny like most laminated cottons you would find. This feature also made these little coats very easy to sew. Speaking of sewing, laminated cottons/fabrics can be a little tricky to work with. I wrote up a whole post full of tips to walk you through everything you need to know before you get started. You can find it on BERNINA USA’s blog: Weallsew.com. I decided to line my little coats with a polar fleece lining to add a cozy factor to them. (My kids are all about cozy!). I picked up both colors from stylishfabric.com. (They are so cheap, just 4.90 a yard!). The lining worked great, but I would add that polar fleece has some stretch to it, so I did have to take in some wedges to get the lining to match up to outer coat. I was nervous it was going to make the inside look a little wonky but you can’t even tell! So you guys, I think I found the solution to a major problem in my life. I have this 2 year old little boy who is obsessed with water. I took my kids to the zoo today, and both of them wore their new coats. My son of course found some water dripping from the roof and stood directly underneath it, while it dripped alllll over him. Usually this would be a big issue (he usually ends up sopping wet when we leave.. well… anywhere), but his coat kept him completely dry. So, I decided I should probably make all of his clothes out of laminated cotton/ waterproof fabric haha. Problem. Solved. At least he’s cute, right? Thanks for reading along! This is such a cute pattern for kids, and perfect for spring weather! Now I just need one in my size. Happy sewing! I am so excited about this post! Sandra Clemons of Make it Blossom invited me to be part of her blog hop for the release of her new fabric line ‘Front Yard’ with Michael Miller Fabrics. There are so many cute prints! I love the bright colors inspired by flowers and views from Sandra’s own front yard. I don’t share a whole lot about my kids on my blog, and I’m excited to share a little more about them today. First of all, taking photos of my kids together is impossible. I envisioned a really sweet picture of them holding hands and smiling, but that did not happen. Also, I haven’t made anything for my little boy in a lonnng time, so I was super excited to finally sew something for him. For my daughter’s dress, I used Sandra’s print called Long Triangles. I usually don’t like sewing clothing in cotton quilting fabrics, but guys, this fabric is so soft! It drapes beautifully! For the dress I used the Millie Dress pattern by Mix It and Make It. (It’s a free pattern!!). A note about this dress pattern, it is made for knit fabrics. I made a few little adjustments to make it work for wovens: I sized up one pattern size, cut 2 of the back bodice instead of cutting on the fold, added seam allowances to the bodice edges (1/2″), I added a 1/2″ seam allowance to both edges of the sleeve pattern piece and for the closure I added a 7-9″ invisible zipper to the dress back. I also finished the neckline edge with single fold bias tape. I love it so much!!! My daughter loves wearing it too. For my little guy’s shirt, I used Sandra’s print called Grass Shaper in blue, and Long Triangles for the little bow tie. Again, the fabric is soft, and I’m thrilled with how the project turned out. For his shirt, I used the Sketchbook Shirt pattern by Oliver and S. I am obsessed with this pattern. I can’t wait to make him a million more. It’s the perfect button down shirt pattern for little guys. The instructions are very clear, and the measurements are spot on. My little guy is almost 2, and his chest measurement was exactly lined up for Size 3, and for length I went with a size 4. (I guess he’s not so little). It’s perfect, and so cute on him!! He also likes wearing it. He keeps bringing it to me and asking to put it on. I think he feels special to finally have a handmade garment. (My daughter always goes for her handmade items first). I wasn’t super into sewing for my kids last year; they grow so fast and go through their clothes so quickly I didn’t think is was really worth it. After this project (and a few from recent months), I’m kind of obsessed. It’s so fun to involve them in the projects, and my daughter loves to sneak out of bed at night and sit next to me when I’m working on something for her. For his little bow tie, I found this tutorial on Pinterest. It’s super quick and easy, and surprisingly survived being worn by him, it wasn’t pulled off once. So a big thumbs up from me! Annnnd I just had to share. My kids are 3 1/2 and almost 2, and I was not prepared for this little photoshoot. Next time I will have better resources (a.k.a candy). (Hence the bottle and chap stick). Here’s some funny out takes. Thank you to Sandra for having me along on the tour! Make sure to take a peek at this gorgeous new fabric line: Front Yard! I recently got to test the waterfall raglan pattern by Chalk and Notch. It comes with two options: a top and dress. I sewed up the dress version, and I’m planning on making many more once time allows! The pattern is for the advanced beginner, and it’s super quick to sew up! The directions are excellent too. Best of all, my daughter absolutely loves it! This dress usually doesn’t make it back into her dresser because she finds it while I’m folding the laundry. It’s a big hit! (Especially because she wears it all day, opposed to the usual three outfit changes we go through on a normal day). Knocked it out of the park Gabriela! Gabriela of Chalk and Notch made a few beautiful versions in stretch velvet and I can’t wait to try the top version in some velvet scraps I have left over from another project. You’ve got to check it out! I’m so thrilled with this pattern. I love the raglan sleeve and the offset ruffle along the bottom, it’s so fun. This is such a great versatile pattern, and I know I’ll be using it for years to come! Thanks Gabriela! Head over to Gabriela’s blog for a big giveaway going on right now, you won’t want to miss it! Hey guys! I’m the second stop of the exciting and most epic Sewing Block Party blog tour, happening all through November! 31 bloggers from all over the world get to share their take on their favorite Petit A Petit patterns. For my post, I introduce to you the Friday dress by Petit A Petit + Family! I was also able to test this lovely pattern, and let me tell yah- we are hooked over here! (This pattern will be released very soon, I’ll make sure to update the link right here!). The Friday Dress has so many fun options within the pattern. I went with option A and long sleeves. I also sized my daughter up a little according to her measurements to the size 3-4 so she would have a little room to grow. (She’s 3 years old). I’m really happy with the final fit, I didn’t make any pattern adjustments. (* Just a note: My back pleat is an error due to testing, it should be flipped the other way, it’s since been corrected in the pattern!). My fabric is from Hancock’s fabric, which is currently rebuilding their company into an online only based fabric store. This fabric was actually left over from a dress I made for myself last year. I’m so glad I had enough to make my daughter a matching dress! I love all the details of this dress: the adorable collar, pocket, waistband, elastic sleeve cuff, and the gathered skirt. There are too many good combination options within this pattern. Now I need to try it in a few other versions! This was my first ever Petit A Petit make, and I’m obsessed, why have I waited so long!? Now I just have to try the new Loveralls pattern, released just yesterday. Don’t forget to take a look at all of the other fabulous patterns they offer in their shop! We are ready for Halloween over here! 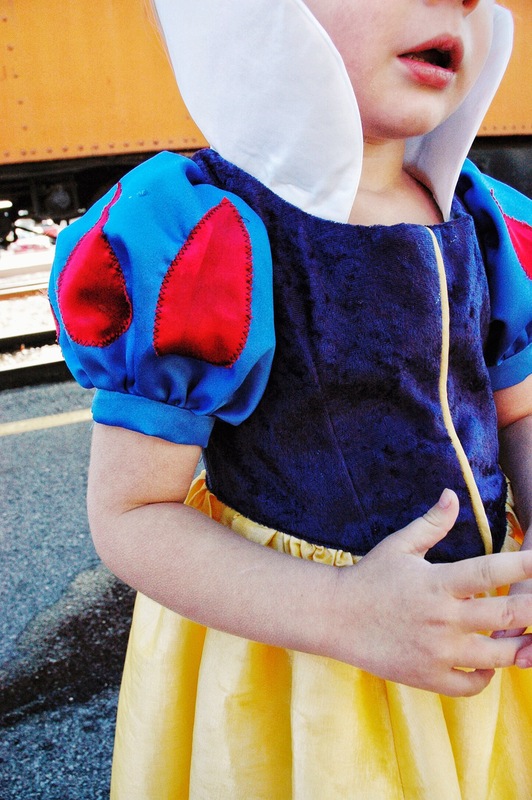 My daughter is princess obsessed so this year she decided she wanted to be Snow White. 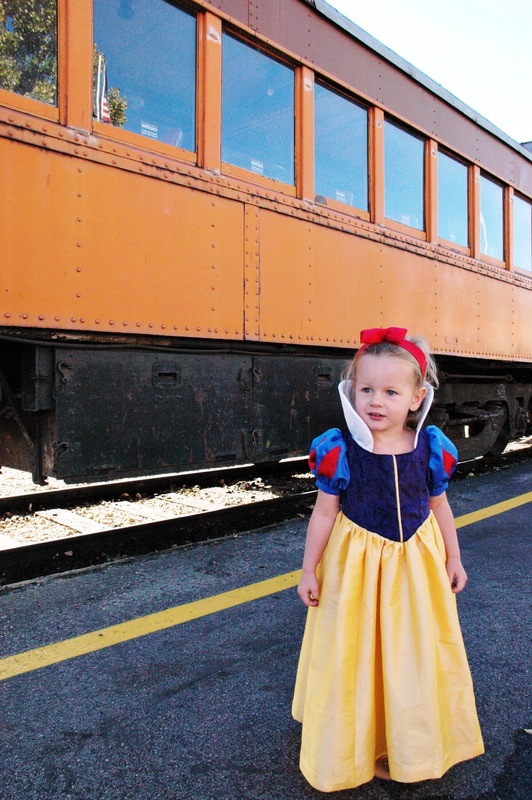 It’s becoming a tradition to make her a new princess costume every year. I actually made this one for her birthday back in August, and we have gotten a lot of use out of it since then. Making costumes for her is definitely one of my favorite things to sew. 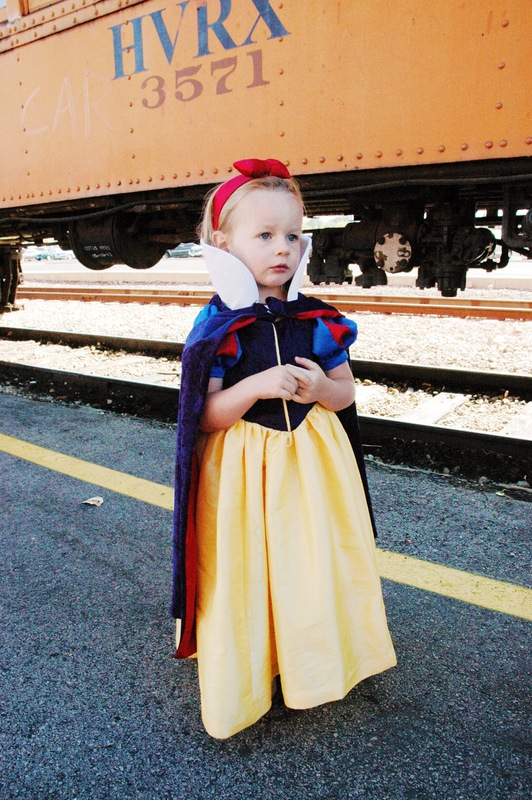 In previous years I made her a costume for Cinderella and Tinkerbell. 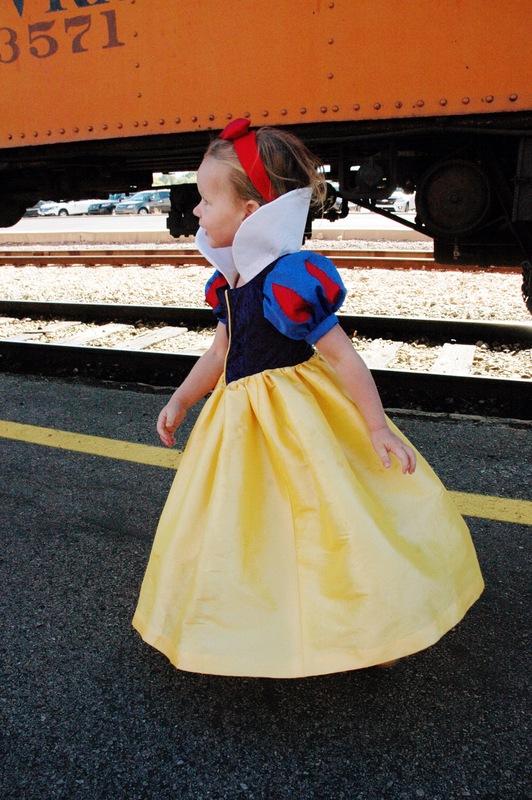 I used Simplicity 2563, (I purchased mine on eBay), and it includes a pattern for both Cinderella and Snow White, so it was very convenient that my daughter wanted to be Snow White this year since I already had this pattern on hand. A few notes about this pattern: I took the neckline up and in slightly, you can see on Cinderella how the neckline is a little strange, it’s also been tacked a good inch on top of the shoulders on either side in those Cinderella photos. Also, this cape. My daughter loves it, but as you can see it fits a little big in the back. It’s just a little too wide for her shoulders so I would adjust that my next go around. Everything else came together really great. I love all of the little details in this costume, and I had a lot of fun picking out the fabrics and putting it all together. 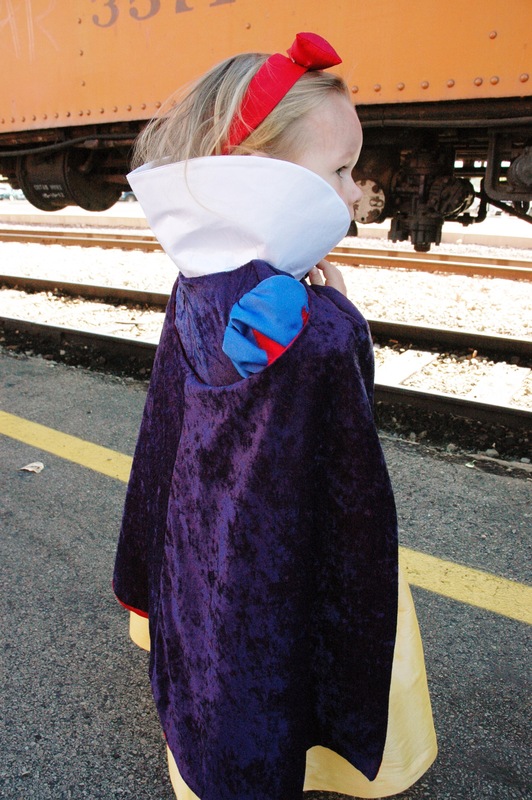 All of my fabrics are from Joann Fabrics: for the bodice and cape back I used a stretch velvet lined with a cotton, this helped give the stretch velvet some stability. For the skirt I used a taffeta, and I really love the crispness of the drape, it really gives the dress a more regal feel and look. The collar is stuck on with Velcro inside the bodice neckline so it’s easy to wear it with or without. The headband is also included in the pattern. I couldn’t be happier with the results, and I know my daughter loves it by the way she proudly runs around telling everyone her mom made it for her. I sure love that girl. Happy Halloween everyone!